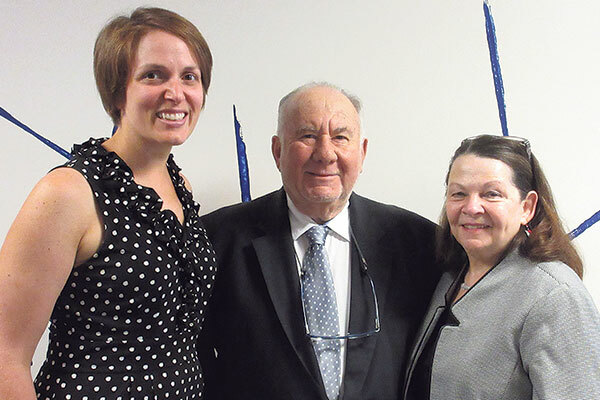 Monica and Kenneth Blumberg visit with Spectrum360’s development director, Diane Berry, left, at the school’s Livingston campus. What began in 1883 as the Daughters of Israel Hebrew Orphanage Asylum in Newark, and underwent a name change in 1963 to become The Children’s Institute, has recently become Spectrum360. Over the years, it has evolved from a home for parentless Jewish children to two nonsectarian schools in Livingston and Verona for young people on all points of the autistic spectrum. The center’s purpose is to provide transitions for young people to life after school to prevent them from languishing and “losing the skills they have worked so hard to gain while in school,” according to a Spectrum 360 brochure. The organization already offers such extra-curricular activities as filmmaking and culinary arts programs that are not covered by public education funds. “There is a great need for money,” Berry said. In a Sept. 1 interview at the school’s Livingston campus, Monica Blumberg, a retired math teacher in the Caldwell school system, said she was made aware of Spectrum360 through working with children on the autistic spectrum in her middle and high school math classes. In July, The Children’s Institute rebranded itself as Spectrum360. Although the Blumbergs were not involved in that decision, Kenneth said he thinks the word “institute” might have represented a stigma for students and their parents. He said the name change suggests a full complement of educational opportunities for students on all parts of the autistic spectrum, from kindergarten through middle and high school. One way he is working to provide that help is by heading the school’s annual “Fore the Kids” golf outing at the Montclair Country Club on Tuesday, Sept. 13.